Tayla Harris made a triumphant comeback on Saturday night, taking Carlton through to the AFLW grand final for the first time ever. 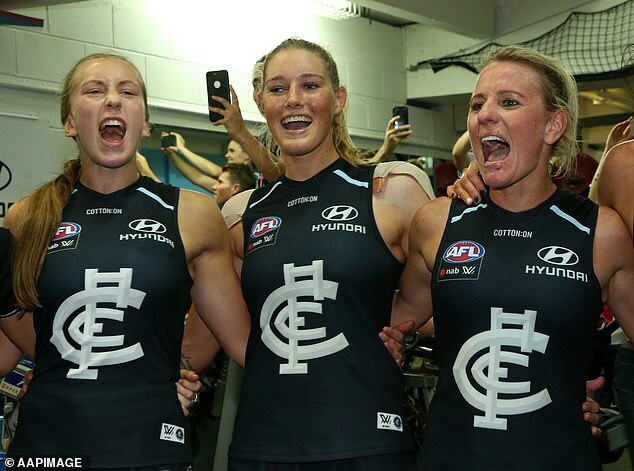 Harris led her team through a defiant performance at the preliminary final at Ikon Park in Melbourne – with the Blues defeating the Dockers 9.10 (64) to 4.4 (28). 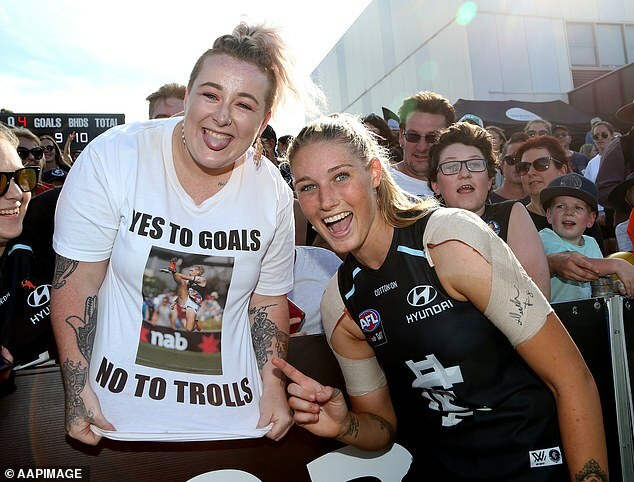 Harris hasn’t let the online vitriol and controversy surrounding a now infamous photograph of her kicking a goal get in the way of taking the Blues into their first ever AFLW grand final. 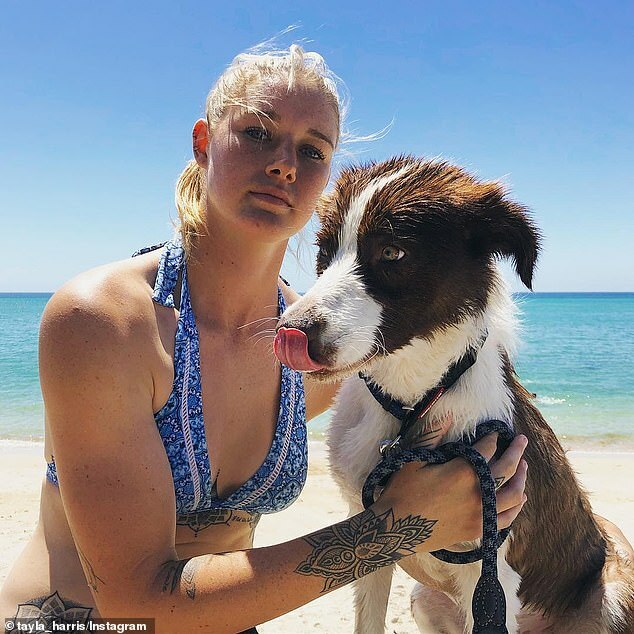 The 21-year-old star’s support from the AFL and AFLW may have contributed to her stellar game – with the athlete saying she was able to find inspiration in the harrassment. ‘If anything it’s helped me, it’s stuff I use as motivation,’ Harris said of the online abuse. Other stands out from the game were Lauren Brazzale and Maddy Prespakis, while Kiara Bowers outshone an otherwise disappointing Dockers performance. But it was Harris’ series of spectacular goals and tackles throughout the game that truly captivated the crowd. Harris stormed the field, as she marked and goalled at around 13 minutes and broke the pack for a big mark inside 50 early in the second term – leading Carlton with six goals by the end of the third quarter. The Freemantle team were plagued with bad luck from the get-go, with captain Kara Donnellan withdrawing from the game half way through due to a problem with her knee. Ashlee Atkins off-field holding her right shoulder after a crunching tackle from Brianna Davey and defender and Evey Gooch was sent off the field with a sore right arm. The standout performance comes after Harris became the unwilling target of online trolls who made a number of sexist and derogatory comments about an athletic image of her which has since gone global. Harris felt some of the vile comments ‘bordered on sexual abuse via social media’ and was told not to walk the streets alone by her boxing coach Gerry Murphy. Australian Prime Minister Scott Morrison even weighed into the drama on Thursday, calling the trolls ‘cowardly grubs’. McLachlan added the online trolling this week of Harris is a societal issue which needs to be urgently addressed. Among the online hate came spurts of patriotism and support – with one die-hard fan going as a far as getting the now iconic image tattooed onto his arm. Blake Griffiths, an Adelaide supporter who now also has Crows coach Don Pyke inked on his other forearm following a radio ‘dare’, told listeners on Mix 102.3 Adelaide he ‘couldn’t be happier’ with both designs. ‘I’ve already got a few tattoos, so I thought why not,’ he said.